I just got my Michael Kors bag today. I just love, love, love it!!!! Thank you so much for making it easy to purchase…and the quality of the bags you offer are awesome. I’ll definitely be coming back to purchase more. Thank you again Kimberly for answering all my questions and making this a smooth and easy transaction. – Kathy D.
I ordered this beautiful Coach crossbody from the Handbag Consignment Shop and it was better than what I expected. The bag was new with tags…it was in excellent shape; but what made this transaction the best ever, was the service. Kimberly couldn’t have been nicer, it was packaged nicely, and arrived within days of me ordering it. Thank you! I will definitely be back. – Kristy B.
Handbag lovers love Handbag Consignment Shop! 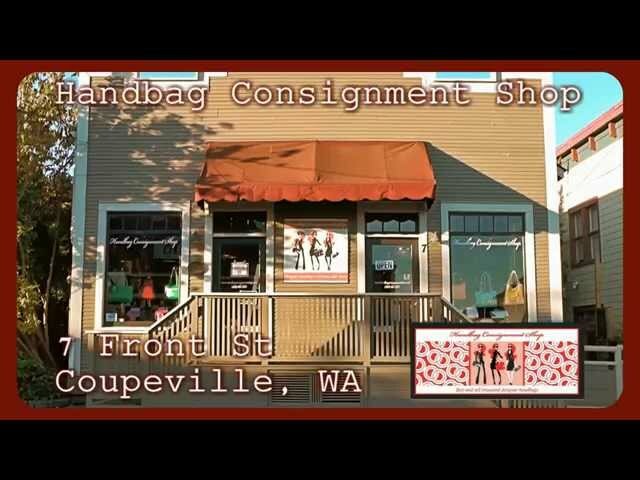 Dedicated to providing savvy shoppers with quality new and “nearly new” designer handbags at affordable prices, Handbag Consignment Shop in historic downtown Coupeville, WA (and online) offers authentic, high-end designer bags at 50-75% off normal retail prices. Choose from Gucci, Chanel, Louis Vuitton, Burberry and more! Founded by a handbag aficionado as a trusted place for other handbag fashionistas to find new treasures, the Handbag Consignment Shop does not buy or support the sale of knock-off or reproductions. They are committed to working with those that heed this creed and mission. Ready to sell a bag? The Handbag Consignment Shop is the place for you. Give them a call, or visit their shop online at www.handbagconsignmentshop.com.